The ONLY method to ensure 100% destruction of Data on Hard-Drives is to physically destroy the Hard-Drive. In today’s technologically advanced environment there are a variety of methods mentioned as to how to destroy digital data on Hard-Drives which include, Degaussing, Wiping, Re-Formatting to name a few. The most important point to know is that the only way to ensure 100% destruction of digital data on Hard-Drives is to destroy the hard-drive containing the information. Once physical destruction has been decided as the method for certifying the destruction and disposal of digital data carriers such as Hard-Drives in turn complying with The General Data Protection Legislation, the level of security provided within your destruction process is the next decision to make. At Security in Shredding, we apply the same state of the art chain of custody protocols for your Hard-Drive Destruction Service as for your Document Destruction Services, ensuring secure, compliant destruction of your media. Our client services destroy and dispose of the above listed material in a secure, compliant and cost-effective manner. We do this through our unique shredding truck that is the only one in Ireland specially designed for media destruction onsite. Irrelevant of the type of media you require destroyed, our unique truck can reduce all material to a 4 mm particle onsite at your premises. This service will ensure compliance against The General Data Protection Regulation for disposing of data, protecting your company from the severe penalties for non-compliance. Why choose Security in Shredding for Hard-Drive Destruction? Our specialist vehicles have been designed specifically for the secure destruction of hard-drives for clients. Our hard-drive shredders have the highest through output available in the Market today minimising time spent onsite at the client’s location. The technology within our specialist hard-drive shredding service is the most secure available to clients as it can destroy hard-drives and media to a 17 mm or a 4 mm shred size. Vehicles are GPS Tracked and immobilised for maximum security. Each Hard-Drive shredder is fitted with our specialist CCTV system establishing our secure perimeter with all areas monitored. Our clients can receive a recording of the full destruction process where each hard-drive unit is recorded as it enters the destruction process in conjunction with a time/date stamp. The full process from Hard-Drive removal right to secure destruction can be completed onsite at the client’s location all under CCTV. Once the hard-drives passed through the destruction process the Data is 100% destroyed. We do not employ “crushing” as the magnetic plates containing the data may still be intact, the [article shred size achieved ensure full destruction of our client’s data. Post each hard-drive destruction service the client receives our unique compliance certification which in turn certifies the destruction of their data. This creates an audit trail for our clients to illustrate compliance in an audit situation. A brief recap of the innovation Security in Shredding have displayed since establishment in 2004 that has directly influenced and shaped the Secure Data Destruction Industry Globally. In 2004 we introduced the first full automated paper shredding technology to Ireland eliminating the need for staff to handle client’s data during the destruction process. Clients in Ireland could then receive a service where their data was automatically lifted and emptied into a destruction process with no physical contact. In 2010 Company Director Sean Kelly, designed and introduced, the first mobile ISO EN 15713 Shred No. 6, double shredding shredder to the world. 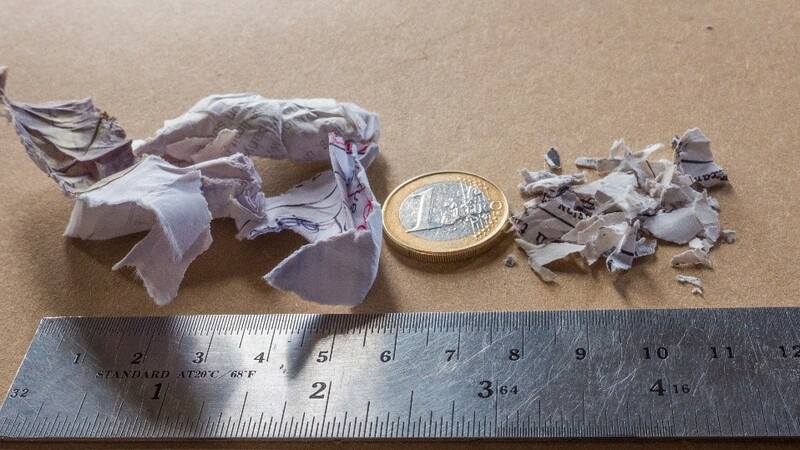 This essentially meant that clients in Ireland and Globally could receive confidential shredding services where the shred size achieved was 1 eighth the size of conventional shredding (Please see picture below). In 2018, we are proud to say that we are the first Irish Secure Data Destruction Company to introduce specialist Onsite Hard-Drive Shredding for clients. Our unique hard-drive shredding technology is the most secure in the Irish Market in order to meet customer requirements for GDPR compliance and risk mitigation. Our specialist shredders have the highest throughout put available in the Market today minimising time spent onsite at the client’s location. Our specialist vehicles have been designed specifically for the secure destruction of hard-drives for clients. The technology within our hard-drive shredding service can destroy hard-drives and media to a 17 mm or a 4 mm shred size. Contact Us Today for your media shredding quote.